Look, it’s safe to say that not every Disney live-action trailer is going to get the glowing support on social media that The Lion King’s did. So, when a new trailer for the upcoming Aladdin dropped during Sunday’s telecast of the Grammy Awards, we were anxious to see what people were saying. 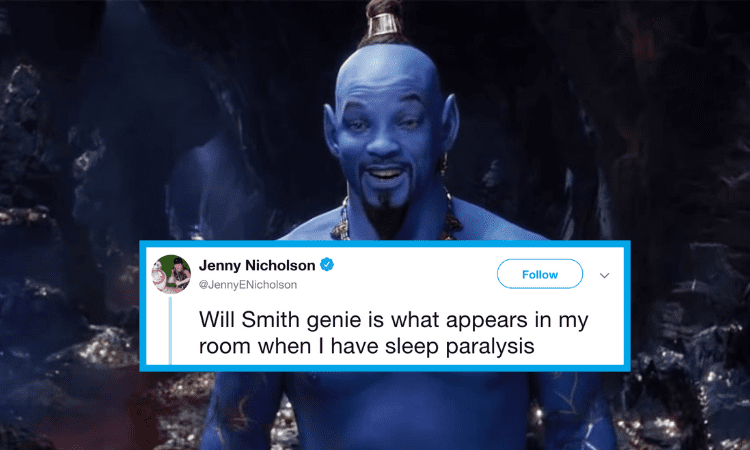 While the film looks absolutely stunning, there was one thing that Twitter could not stop talking about – Will Smith’s Genie. When the first image of the movie was released earlier this year and revealed the Genie looking very human, people had some thoughts on the fact that he wasn’t blue. Smith did clear things on Instagram up by saying the photo was actually of the Genie in his human disguise and that he would be absolutely be blue and CGI most of the movie. Well, now that the next trailer has dropped and he is, in fact, very blue – people, of course, also have plenty of thoughts. Read on to see some of our favorite reactions to the Genie below! In addition to Smith, the trailer offered new looks at Mena Massoud as Aladdin, Naomi Scott as Jasmine and Marwan Kenzari as Jafar. Aladdin, which will be directed by Guy Ritchie, will also star Navid Negahasn, Nasim Pedrad, Billy Magnussen, and Numan Acar. It’s expected to include classic songs from the original as well as a couple of new tunes written by Academy Award-winning composer Alan Menken and songwriters Benj Pasek and Justin Paul (The Greatest Showman and Dear Evan Hansen). What did you think of Will Smith’s genie? Aladdin will hit theaters on May 24th and you can check out the latest trailer below!